Like many parents, I have a computer game obsessed 7 year old and worry constantly about him getting too much screen-time. It’s hard to find the balance between letting them do an activity they enjoy and one which can be creative, imaginative and stimulating, and them becoming pale, twitchy little creatures who have never kicked a football in their lives. 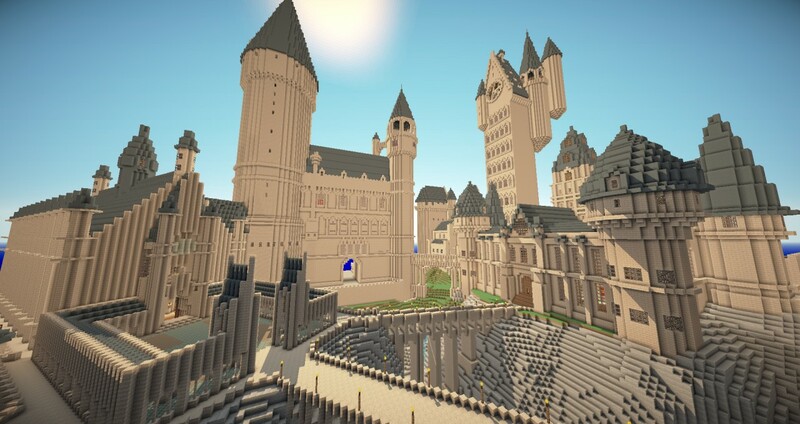 Anyone with a child over the age of five will have heard of Minecraft, but how many of us have watched our children play it, or even better, sat down and played it ourselves? It’s an amazing, enormous and engaging game, full of potential to create fantastic new worlds. Yes, they might spend a lot of their time attacking their friends to steal the items they have mined, or talking about zombies and creepers, but they also learn how to gather the raw materials in the game and use them to make… well… pretty much anything they want. Usually they start with houses and simple structures but the options really are endless. Here are a few projects you could encourage your children to try – they will get them thinking but also let them have some Minecraft time – win-win, surely! This is a fairly simple idea for all ages. 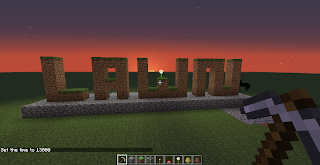 Use blocks to build giant words. You could also try to show the words meaning by using colours and materials to help explain the idea, such as making the word lava red and hot-looking. If your child likes building houses, why not add a farm? Have them think about the plants and animals they would have to keep to sustain themselves or their family. 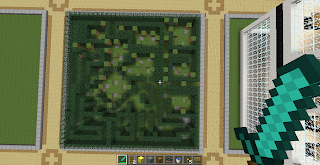 Test out your map and compass skills by flying around your minecraft world. Flying is only available in creative mode but is much quicker than walking and is a great way of getting to grips with basic navigation. If your child is studying Egypt or ancient civilisations in general, why not have a go at making a pyramid? Have a look at other types of pyramid and similar structures too – Mayan, Peruvian and how they differed. Afterwards they could look at how easy each one is to destroy too! 5. Construct the Roman Colosseum, Greek Parthenon or another ancient structure. Similar to the pyramids but takes a lot more work! Pick a time period, research the architecture of the time then try to recreate it. You could compare to how the structures look today to see how they have changed over time. If your child likes playing with friends, have them build a maze for your friends to get lost in. You can build in any shape or material and add traps, monsters and holes to make it more fun. This one comes straight from the imagination of my son. After a trip to London he was inspired to try and make the Globe Theatre, then populate it with ‘mobs’ (creepers etc) and have them act out a play. Though as he said, they would probably just kill each other rather than doing anything creative. Harry Potter, Jack and the Beanstalk, even Frozen could inspire a creative scene. Use a skin editor such as www.minecraftskins.com/skin-editor/ to make characters – they could look like your child, his friends, or even characters from books and films. When my son started asking me about how ores were mined, I realised that Minecraft fever really had set in but also that it could provide a launchpad for discussing things that were Actual Real Life Stuff rather than just in computer games (ie. mushrooms don’t really have eyes/Mario doesn’t really live in Italy). Minecraft is a great lesson in sustainability, how to create things using the world around you and survive off the land. You could discuss ores (geology), how plants grow (plant biology), navigation techniques such as following the sun and finding your way back without torches at night, geography and map reading, wilderness survival skills. You could also look at how historically, man would have torn apart the landscape to build and therefore about the human footprint on the Earth, how our presence has changed the planet, how great temples would have taken a vast amount of time and resources. On top of this you have more general skills garnered from the game: building, planning, interior design, patience, problem solving, respecting others’ builds, leadership skills, mediation, architectural structuring, team working and perhaps most importantly, learning that there are endless possibilities with the smallest and most simple things if you just have the vision and the teamwork.